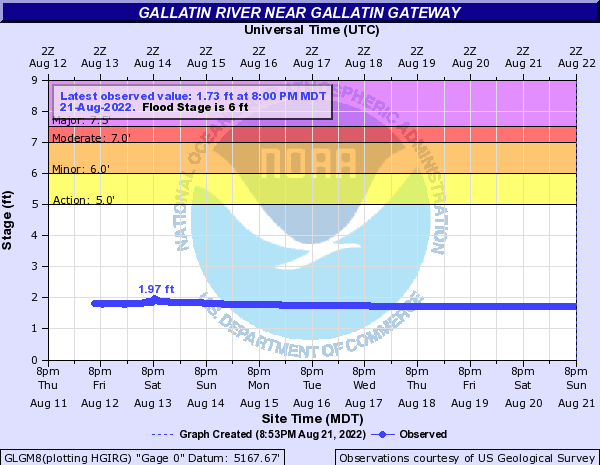 This is the most commonly run section of the Gallatin. Putting in at Moose flats campground and taking out at the Storm Castle Bridge provides floaters with nearly every rapid this river has to offer. Depending on time and flows many options are available to make the float shorter. Everything above the 35mph bridge is CLIII at all flows. At high flows there is good play and a couple of big feeling wave trains. Below the bridge things step up a full grade regardless of flows. At low flows there are technical eddies, attainments and rock boofs. At high flows (4000+) there is lots of funny water, big wave trains and some big holes to miss (or hit). The less paddled section between the two storm castle accesses steps back down in difficulty but offers the only rapids separated from the road. This is the afterwork special for Bozeman and Big Sky paddlers. Moose flats is the highest put-in that is commonly used. Most will opt for this put-in for a long day or during high water only. Short run put-in/ Upper take out. Long pull out/Thumper rapid. Typical put in <1000 cfs. Greek Creek put-in. Please park at one of the pullouts and not in the campsite, as it is not a day use area. There are two parking lots labaled "Storm Castle" on highway 191. This is the "upper" lot. This is the typical take-out for the mad-mile section, and marks the end of the CL IV whitewater. Putting in here is an option for more novice paddlers who are prepared for somewhat continous CL III. When things are crowded get your things out of the water quickly as the eddy is small and things have a tendency to turn into a cluster. The lower of the two storm castle parking lots. This is easily distinguished as it has a bridge next to it. This is typically the lowest take-out used by those looking for whitewater.